Human cells somehow squeeze two meters of double-stranded DNA into the space of a typical chromosome, a package 10,000 times smaller than the volume of genetic material it contains. 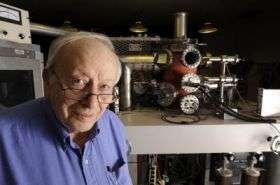 "It is like compacting your entire wardrobe into a shoebox," said Riccardo Levi-Setti, Professor Emeritus in Physics at the University of Chicago. Now research into single-celled, aquatic algae called dinoflagellates is showing that these and related organisms may have evolved more than one way to achieve this feat of genetic packing. Even so, the evolution of chromosomes in dinoflagellates, humans and other mammals seem to share a common biochemical basis, according to a team Levi-Setti led. The team's findings appear online, in Science Direct's list of papers in press in the European Journal of Cell Biology. Packing the whole length of DNA into tiny chromosomes is problematic because DNA carries a negative charge that, unless neutralized, prevents any attempt at folding and coiling due to electrostatic repulsion. The larger the quantity of DNA, the more negative charge must be neutralized along its length. "Dinoflagellates have much more nuclear DNA than humans," said Texas A&M biologist Peter Rizzo, who collaborated on the research with Levi-Setti and Konstantin Gavrilov, a Visiting Research Scientist in the Enrico Fermi Institute at the University of Chicago. Every bit of DNA must be properly duplicated and divided to facilitate reproduction and growth. In humans and mammals, proteins called histones partially neutralize the DNA's negative charge. When histones wrap themselves in DNA, they become nucleosomes. Dinoflagellates are stuffed at the core with tightly compacted chromosomes, yet these organisms contain neither histones nor nucleosomes. "What takes care of neutralizing DNA, to allow chromosomes to condense?" Levi-Setti asked. "Most biology books do not tell you." Other scientists had already identified positively charged atoms called cations as neutralizing factors. They found that dinoflagellate chromosomes explode upon the removal of calcium and magnesium cations. Levi-Setti has produced the first images of the distribution of these cations in dinoflagellate chromosomes. These images verify that cations, mainly of calcium and magnesium, neutralize DNA's enormous negative charge, and further suggest a critical role in folding the protein as well. The finding raises questions about the evolution of chromosomes, Rizzo said. "Did dinoflagellates once have histones and then lost them? Or did dinoflagellates never have histones and just 'figured out' a different way to fold large amounts of DNA into chromosomes?" Rizzo asked. The images were produced using a high-resolution scanning ion microprobe, an instrument that Levi-Setti developed in the 1980s jointly with Hughes Research Laboratories in Malibu, Calif. For the last 15 years, Levi-Setti has collaborated with associates of pioneering chromosome researcher Janet Rowley, the Blum-Riese Distinguished Service Professor in Medicine, Molecular Genetics & Cell Biology and Human Genetics at the University of Chicago. In 2001, the collaboration demonstrated that cations play an important role in compacting mammalian DNA and helping chromosomes maintain their structure. "Chromosomes would fall apart when calcium and magnesium were removed," Levi-Setti said. Wondering if there could be a fundamental evolutionary process at work, Levi-Setti extended his research to the fruit fly. Like mammals, fruit flies belong to the pantheon of eukaryotes. In contrast to prokaryotes like bacteria, eukaryotes pack their genetic material in a cellular nucleus. Prokaryotes lack a nucleus. "Cations play a very important role in the folding and charge neutralization of DNA in all eukaryotes, but more so in dinoflagellates," Rizzo said. "I find it truly amazing that in all other eukaryotes, histones help in this charge neutralization, and dinoflagellates constitute the only exception to this nearly universal rule. It looks like this may have been the first and very efficient step toward the goal of neutralizing DNA, long before histones came into play."